The Works jerky is a little bit sweet and a little bit spicy. That is because it is made with brown sugar and red pepper. It is thinly cut just like our "Slab" jerky. 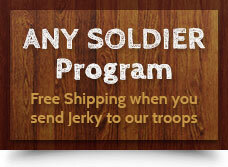 This has quickly become a favorite jerky flavor! You will receive 4 individual 4oz packages of The Works for every pound purchased.